See the best of what Prague has to offer! Our exciting & informative bike tour takes you through the best of what Prague has to offer. 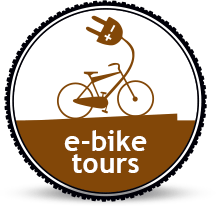 This tour takes advantage of our electric bikes, combining traditional biking with an added electric motor, making cycling and climbing hills easy. We will cover more, with less effort! Take off on a spectacular bike journey down the amazing side streets of Prague, beautiful parks, stunning viewpoints, Prague Castle and enjoy all the beauty and diversity this European gem. You'll have a chance to view Prague's exceptional architecture including all the famous landmarks. During the tour we will have a relaxing break at beer garden to enjoy amazing views over the Old City of Prague. Our tour moves at a very comfortable pace. Riders of all levels will enjoy this tour, even those who haven't ridden a bike in awhile. Our friendly and energetic staff will guarantee you will have a good time!